Chiropractic Leawood: What are the Symptoms of Whiplash? Often experienced as a result of a car accident, whiplash is a serious condition that can create life-long neck problems if left unchecked. It is caused when your head is suddenly “whipped” in a back and forth motion traumatizing the neck. Though most people connect whiplash to auto accidents, it can be caused by any even that causes the head to move in such a violent manner. 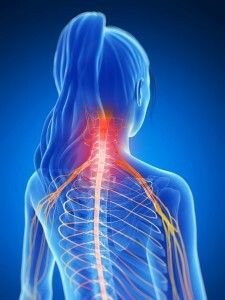 Pain – Both in the neck and in the head that worsens when you move your head from side to side or front to back. Tightness in neck – Decreased range of motion will only exacerbate over time, creating diminished use of the neck and shoulders. Tenderness – Found in the neck, between the shoulders and upper back. Headaches – Recurring headaches that begin at the base of the skull and radiate toward the forehead are telltale signs of whiplash. Unfortunately, the classic symptoms of whiplash may not be apparent immediately after an accident or trauma occurs. Some patients even report weeks of being pain-free after a car accident before symptoms appeared or became incessant. This delay is normal but increases the need for immediate medical attention, regardless of how minor the accident seemed at the time. Treated properly, within a helpful time period, whiplash should heal completely, leaving your body to be as flexible and agile as before – if you respond quickly. Don’t take seemingly minor symptoms for granted after an accident as they are likely to progress into something that will be difficult to manage in the future. We recommend regular chiropractic care, massage, at-home exercises and even acupuncture as needed. To fully assess whether your symptoms are the result of a whiplash injury, call for your full exam at 913-681-7757 now. We can help you overcome your symptoms and find long-term, natural pain relief.